When novice witch Caitlyn Le Fey heads to the outdoor cinema festival at a beautiful Cotswolds manor, the last thing she expects is for the evening to end in murder. But when a dead man is found with fang marks in his neck and her old vampire uncle, Viktor, is arrested, Caitlyn must use all her newfound magic powers to clear his name. Sleuthing isn’t simple, however, with so many strangers arriving at her grandmother’s enchanted chocolate shop: there’s the secretive village tenant with creepy Goth tastes, the inscrutable new butler at Huntingdon Manor–and a charming Frenchman keen to win Caitlyn’s heart. And that’s before she has to master the art of making the perfect chocolate soufflé or deal with a Levitation spell gone horribly wrong! Still, at least she has the help of a friendly English mastiff and her naughty kitten, Nibs, not to mention her sassy American cousin and all the village gossips! Then a wild goose chase leads to an unexpected discovery and Caitlyn realises that she’s missed a clue under her nose all along. Can she solve the mystery–and maybe even discover Lord James Fitzroy’s real feelings for her? Or will she succumb to a vampire’s fatal bite? I received a free copy of this book from the author and voluntarily reviewed it. I am always looking forward to the next book in this series as it’s such a fun series! 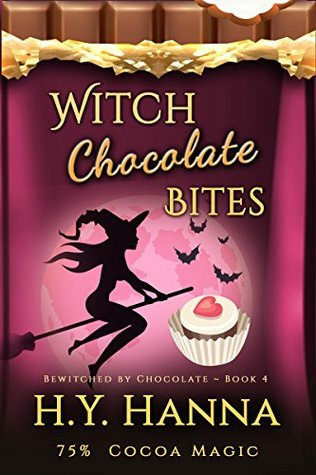 Witch Chocolate Bites was another great book in this series and I flew through it. It’s a bit silly at times, but mostly a lot of fun. The author combines the mystery with the paranormal elements really well, the magic and paranormal add a nice touch and enhances the story instead of detracting from it. The mystery part of this novel was well done, although I was able to predict the murderer very early on already, which was a bit of a shame. I thought it was a bit too obvious, even while there were numerous suspects. I also was 100% about someone who I was sure wasn’t the murderer and I was happy to be right about that. But there was a nice twist toward the end that I hadn’t predicted and I liked how everything fell on it’s place at the end and we find out the why’s behind everything. the paranormal aspect was present as well as part of this mystery and I can’t help but think this is all building up towards something big paranormal related. It’s also nice to see all the little clues and hints the author sprinkled throughout the story when looking back once you finished the book. I liked being back in this small town in the Cotswold and following Caitlyn and her friends. I even agreed with Pomona a few times in this book, which usually doesn’t happen. There are some fun scenes again, a hint of romance and some trouble Caitlyn finds herself in. I didn’t really care for the attempt to create a sort of love triangle in this book, but by the end of this book I think things are resolved surrounding that. The ending is a bit of a shocker and I really want to know what happens next. This book focuses a bit more on vampire lore and vampires, which is a topic that got touched upon a bit with Cailtyn’s vampire uncle Victor in previous book, but never got addressed in much depth. So it was great to read a bit more about how vampires work in this world. And there even was a bit of a tie in with the murder. And we see more of Victor as well. I enjoyed reading about the delicious chocolate creations in this book and the chocolate souffle they made in this book sounds delicious! There is a bit of magic as well, although it did bother me a bit how the characters weren’t as careful with displaying magic as I thought they would, given that they want to keep their magic a secret, but ofcourse that all ties into the plot in most cases so it had a function. To summarize: I had a lot of fun reading this book! I enjoyed returning to this small village in the Cotswold with it’s magic and murder. The mystery was well done, although I did guess from the start who was the murderer. There was a nice twist toward the end that I hadn’t predicted though, so that was a nice surprise. The paranormal aspects are nicely woven throughout the story and add a nice touch. In this book we learn a bit more about vampires, which was fun as so far we only got a few bits and pieces. There are also some great descriptions of the chocolate goods they sell and a slight hint of a possible romance. Another great book in this series! What’s the last food item you read about in a book? I read a book a while back where the heroine owned a bakery. I have a huge sweet tooth so she made me hungry. This sounds really good and that cover is really cute. Books with food descriptions in it often make my hungry. This series is great and the covers are so fun with how they look like chocolate bars. I was reading about a grumpy housekeeper who kept serving up cauliflower cheese when she was fed up with the new owner of the house – which was often… Thank you for another great review, Lola:). Glad the series continues to please you. Always a good sign that even though the mystery plot wasn’t as challenging that there was still other matters that kept it from being a disappointment. There seems to be some good humor in this series that has appeal to me and good that the triangle didn’t last that long. My last food item was probably in A Conspiracy in Belgravia because the heroine, Charlotte, loved cakes and creams with tea. I think a jelly roll cake was the last one mentioned. It’s a fun series so far :). It was too bad the mystery wasn’t as challenging here, but I still really enjoyed the book. It has some humorous touches which really work here. Oh that sounds fun a heroine who loves cakes and creams with her tea.